After nearly two years of planning, a group of homeless veterans in Kansas City, Missouri will once again have a place to call home. 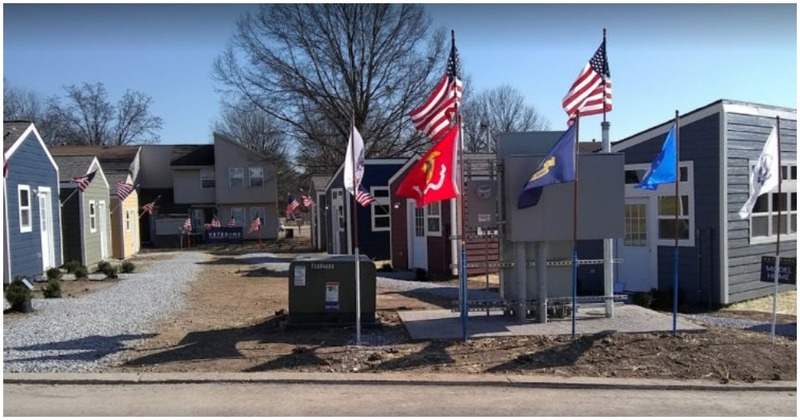 The Veterans Community Project built 13 tiny homes, consisting of four family units and nine single units, and all are fully functional. Not only will these veterans finally have a place to call home, they will also have access to instructive classes on how to manage money, cook, stay healthy, and combat substance abuse. Members of the Veterans Community Project say that without these homes, many of the veterans would end up in jail or could still be homeless. The plan is to continue on the progress made here by adding 19 more homes during the second phase of the project. There are also big plans to build a community center for the residents. During an incredibly emotional ribbon-cutting ceremony, the Veterans Community Project was given the City Council’s final blessing: the electricity was activated in the newly designed homes. Far too many of our brave men and women struggle with homelessness and addiction. The U.S. Department of Housing and Urban Development estimates that there are approximately 40,000 homeless veterans, the majority of which are between the ages of 50 and 60 years old. The numbers of homeless veterans are in decline, partly due to initiatives like the Veterans Community Project. Housing and community projects like the one taking place here in Kansas City is hopefully the beginning of more projects that give back to our veterans. The combination of a wonderful place to live and the tools to live a better life, as modeled here by the Veterans Community Project, is a tremendous accomplishment for everyone involved.